Top array makers are scrambling to ensure they have an all-flash storage offering to satisfy customer requirements and shareholder expectations. The pull factor towards the all-flash array has been the requirements of virtualisation in which the random and high volume I/O generated by many servers or desktops has swamped existing spinning disk systems with their relatively slow access to data. The push factor for the big storage suppliers has been the plethora of startup all-flash array suppliers that sprung on to the scene with ground-up designed products optimised for flash. The big seven faced a choice: Design or buy products optimised for flash, or retro-fit existing arrays to make them all-flash. Both routes have pitfalls. Buying or designing purpose-built flash arrays takes time and money. But retro-fitting an existing product to flash means giving away performance to those with flash-optimised products because architectures designed around spinning disk will always create performance bottlenecks when used with flash. Nevertheless, the incumbent storage array makers have adopted one or, in some cases, both of these strategies. In this there is not much change since last year. Some have rushed to an all-flash strategy and others have lagged. EMC and IBM have gone down the route of buying flash specialists and subsequently developing those products. Meanwhile, HP, Hitachi Data Systems (HDS), Dell and Fujitsu have opted to retrofit existing arrays with flash capability. Some claim to have architectures that have, to some extent, been optimised for flash (HP, HDS) while others make no such claims (Dell, Fujitsu). Finally, NetApp has taken a hybrid approach, retrofitting some of its EF and FAS products for flash while promising a ground-up flash system in FlashRay. All these approaches have convincing arguments behind them. On the one hand, some customers need the millions of IOPS provided by flash-optimised systems. On the other, there are plenty of customers who need a boost, but of a lesser magnitude, to provide for their needs. What's wrong with flash storage: And what will come after? Some companies are questioning whether all-flash is the way to go. After all, for the most part a hybrid flash/spinning disk approach seems to be winning out for the time being. And even if we presume that solid state storage will eventually supplant spinning disk for all primary storage use cases, will it be flash that provides it? But that’s another question for another time. Here are what the biggest seven storage suppliers offer now in terms of all-flash arrays. 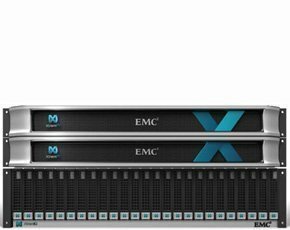 EMC entered the flash array fray when it bought Israeli startup XtremIO in May 2012 and in 2013 rebranded all its flash offerings around the Xtrem prefix. First available in July 2013, the XtremIO flash array debuted as an iSCSI- (10Gbps) and 8Gbps Fibre Channel-connected all-eMLC SAN array built from X-Brick head and capacity units. These come in 5TB, 10TB and 20TB capacities. Customers can build an entry-level system of 10TB using two 5TB “baby X-bricks” or go to a maximum 120TB with six 20TB units and achieve in excess of 1 million IOPS, says EMC. In July 2014, Xtremio hardware was upgraded with Intel Ivy Bridge CPUs, while the XIOS 3.0 operating system (OS) gained new data services, including: AES256 hardware-accelerated data-at-rest encryption; compression aimed at giving a 2x to 4x data reduction rate for database workloads, and snapshots that update changed blocks only. These were added to existing thin provisioning, data deduplication and data protection services. XtremIO was developed from the ground up to work with flash memory and is therefore a standalone product with its own OS that cannot work natively with other EMC storage arrays. XtremIO arrays can be chosen as part of converged server/storage/network vBlock systems. HP first announced an all-flash version of its 3Par P10000 array in July 2012, but added to that with the 3Par StoreServ 7450 array in mid-2013. This year the 7450 was upgraded to an effective capacity of 192TB from 1.6TB raw, aided by HP’s so-called Adaptive Sparing, which sees the supplier use some of the spare capacity on the drive that’s usually held in reserve by media suppliers. In July, HP also added inline hardware-driven data deduplication powered by its custom controller ASIC that HP says can result in reduction ratios of between 4:1 and 10:1. Total raw capacity on the 7450 is 460TB with a claimed maximum after data reduction of 1.38PB. These upgrades have allowed HP VP of storage marketing Craig Nunes to claim the 7450 can provide all-flash capacity at around $2/GB. The 3Par 7450 is not a ground-up flash design but the 3Par OS and controller ASIC has some flash-friendly features that help reduce wear and provides the fine levels of granularity suited to flash cell block sizes. NetApp entered the all-flash market with the EF540 with up to 38TB of 800GB eMLC SSDs in 12 or 24 drive slots up to a maximum of 48, and which will deliver around 300,000 IOPS. Then in November 2013 it added the EF550, an array of the same pedigree, but with added capacity to 96TB in up to 120 drives and a claimed 400,000 sustained IOPS. It has 16Gbps Fibre Channel connectivity compared to the EF540’s 8Gbps. The EF series arrays are the former LSI Engenio products, originally designed for spinning disk and lacking advanced features like compression and data deduplication. They are seen as something of a stopgap until NetApp comes up with its own all-flash product designed from the ground up. That’s going to come in the form of FlashRay, being developed by an R&D team led by former NetApp CTO Brian Pawlowski. Solid facts are scarce, but NetApp says it will deliver: low latency; high IOPS; premium features such as data deduplication, compression, snapshots and replication; object data management; and scale-out clustering capability. A product announcement and news of customer betas is due this month (September 2014). The third leg of NetApp’s flash strategy is the ability to equip one of its top end FAS subsystems, the FAS8080EX, as an all-flash array. The FAS8080EX has the new Intel Ivy Bridge processors in a base unit with 18TB of Flash Cache with room for 1,440 drives, which can be all MLC, all spinning disk HDD or a combination of the two to a maximum capacity of around 5.8PB. IBM’s route to flash started with the acquisition route. It bought Texas Memory Systems in 2012 and rebranded TMS RamSan systems as IBM FlashSystem. But, this year, the former TMS arrays – the 820, 810, 720 and 710 – were superceded by a pair of entirely new products, the FlashSystem V840 and 840. The V840 is the flagship all-flash array and is integrated with IBM’s SAN Volume Controller storage virtualisation product. The latest version has 32 processor cores and 128GB of cache. IBM claims up to 2.5 million IOPS with sub-millisecond latency and raw capacity of 320TB in eMLC drives for eight flash enclosures, a figure that leaps to around 1.6PB when using compression. The 840 scales from 2TB to 48TB, also in eMLC drives, has sub-millisecond latency and IOPS in the regions of one million. It is aimed at performance use cases, in particular with databases where application functionality will take the place of storage functions such as replication. HDS announced the Hitachi Accelerated Flash Storage (HAFS) module for its enterprise SAN VSP platforms in 2012. The HAFS module comprises a controller with a custom ASIC and firmware developed around MLC flash and can now also be deployed with HDS’s Hitachi Unified Storage (HUS) arrays. HDS offers HAFS in 2U modules with standard 2.5” 400GB or 800GB MLC drives to provide a maximum capacity of 19.2TB or a dense array with its proprietary Flash Module Drives (1.6TB or 3.2TB) that provide up to 38TB of MLC flash. Up to four flash enclosures can be housed in a VSP array. VSP can also treat HAFS as a distinct tier of storage using its Hitachi Dynamic Tiering. HDS claims 1 million IOPS performance for HAFS but it’s difficult to tell from company spec sheets whether this is for the flash element alone or for HAFS in a VSP or HUS array alongside spinning disk, both of which scale to multiple petabytes. Dell has also taken the route of modifying existing products to meet the need for flash performance. It upgraded its Dell Compellent Storage Center OS to version 6.4. The Flash Optimised Solution, powered by Storage Center 6.4 and comprising SLC and MLC drives in one of its SC220 expansion enclosures, was Dell’s first foray into flash. Dell says it gets 300,000 IOPS, which is relatively low, especially with SLC on board, and suggests Dell has not optimised Storage Center to deal with the back-end tasks of managing flash memory. Dell has since announced the Dell SC4020, that combines iSCSI and Fibre Channel block access in a midrange SAN that can be configured as all-flash. The SC4020 uses the Compellent Storage Center controller OS, with iSCSI functionality taken care of in the network card. The 2U Intel Ivy Bridge-powered SC4020 can accommodate 24 drives of spinning disk or MLC or SLC flash. Two 24-drive expansion boxes can be added for a maximum capacity of around 500TB. The SC4020 can be configured as an all-flash array, but without controller hardware and software optimised for flash this tops out at a performance of around 120,000 IOPS and latency of “less than a millisecond”. Dell focuses marketing efforts on the use of auto-tiering and Storage Center’s ability to move data at sub-LUN level, with different parts of the same LUN living on different classes of storage media. Fujitsu has one array designated for all-flash, the Eternus DX200F, which offers up to around 38TB capacity. Fujitsu makes a virtue of the fact it is built on exactly the same architecture as the Eternus spinning disk products and so comes at a lower price point than ground-up designed flash arrays. The DX400F comes with up to 24 800GB or 1.6TB eMLC drives and claimed performance of around 200,000 IOPS and sub-millisecond latency.